Race Recap: City v Wharf 5k & a PB! A lovely day — cool and partly sunny — dawned for the City v Wharf 5k in Victoria Park. The race was at 6pm, a slightly unusual running time for me, but I fueled well for lunch and packed a peanut butter and honey sandwich along with a banana for my pre-race snack. When we got to the race HQ, we dropped off our bags and were instructed to pick up our “City Runner” or “Wharf Runner” sweatbands — not a bad perk for the entry fee. I wanted to use this chip-timed 5k as a test of my fitness and to see how close I could get to my PB from 2012. I have been getting to the track pretty consistently over the past month and have had some good longer runs in preparation for the Middlesex 10k next weekend, so a PB was not impossible to consider. As usual, I set myself two goals: a dream goal — run a PB — and a more conservative, achievable goal — run as close to 22:00 as possible and ideally under. Since 5k races are over almost as soon as they begin, it’s good to have a race strategy. I recently read an article on Runner’s World about how professionals pace mid-distance track races: in the 1500m and 5000m, the first and last laps are almost always the fastest. I thought that could work well for a flat road 5k, so I decided to try and run the first kilometer fast, the middle three steady and more relaxed, and the last one fast. To run a PB I needed to run the first and last kilometers around 4:00 and the middle three at an average pace of 4:20/km. The pacing strategy worked: I ran an almost perfect inverse pyramid of 4:04, 4:18, 4:30, 4:22, and 4:00 kilometers. I might have gone out too fast, as the 4:30 third kilometer was probably too slow, but it paid off in any case because I ran a PR/PB by 6 seconds! I stopped my Garmin at the finish exactly on my previous PB of 21:18, so it wasn’t until I got home and saw the official chip time results that I knew it was a PB. My official time was 21:12 (average pace of 4:14/km / 6:50/mile). I was the 13th woman of 260 and 146th of 801 runners overall. I am really pleased with the time and it proves that I am in good shape at the moment. Two of my co-workers also ran PBs and the other two ran really well — one had a dramatic sprint finish with a guy from another company. The post-race food was unfortunately non-existent — just bowls of candy — but the atmosphere was great and it was fun to race on a weekday evening. Cycling home felt really easy after the effort I gave in the race. Next up: Middlesex 10k in Victoria Park — a fast club race back in my favourite racing location! Two Years Ago: Naan and Käsekuchen (German Cheesecake) — make the cheesecake. You will not regret it. 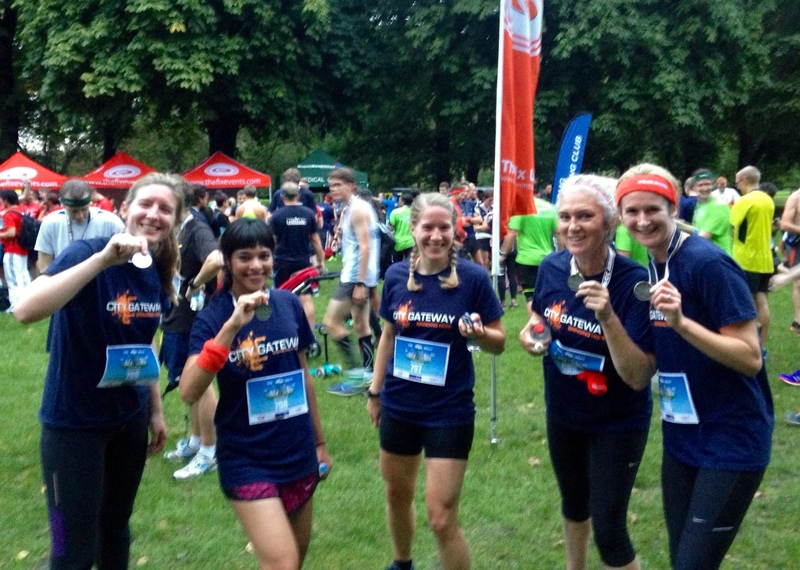 This entry was posted in community, exercise, health, Highlights, pictures, Race Recap, running and tagged 5k, Canary Wharf, London, London Heathside, PB, road race, road racing, Runner's World, Victoria Park on 26.09.2015 by taplatt. Thank you! I’m really pleased.